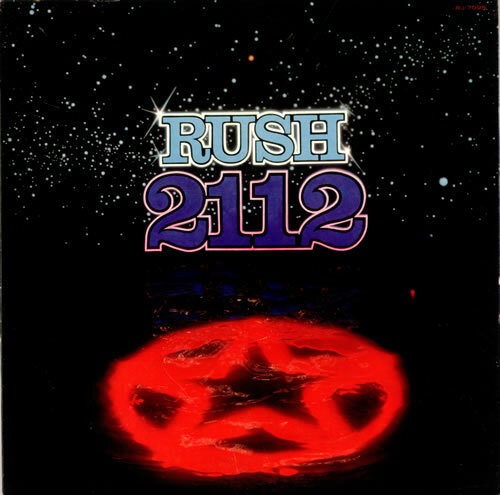 "2112" was the first Rush album I bought, and this is my 2112th post, so it seems only proper to dedicate it to this great album. "2112" was the breakthrough album for the band. It was their 4th studio album. Someone said it "is a comically pretentious, futuristic rock opera written by a nerdy drummer and sung by a whiny-voiced geek. It also happens to be a great piece of rock & roll that lifts the listener through a variety of moods and textures"
It`s whitout a doubt an important album in the history of rock music. Great songs, great arrangements, great lyrics – amazing music. Before 1976, Rush had released a competent self-titled debut, with bassist/vocalist Geddy Lee (Gary Lee Weinrib), guitarist Alex Lifeson (Alex Zivojinovich, of which 'life-son' is a literal translation), and drummer John Rutsey doing a passable imitation of Led Zeppelin. Following Rutsey's amicable departure, Lee and Lifeson were joined by mad percussionist and thoughtful lyricist Neil Peart, whose influence was evident over the next two LPs ("Fly By Night" and "Caress of Steel"). But although there was lots of good music on them, the band hadn't quite found its voice yet. Let`s celebrate! Below you can watch the entire "2112", live in Passaic, NJ 12/10/76, and some other cool live stuff. Find all the lyrics here - and more stuff on the album here.